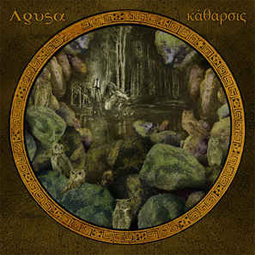 Katarsis is the latest release from Swedish progressive rock band Agusa. This is a live recording taken from their February 12, 2016 performance at the Six D.O.G.S. club, inAthens, Greece, during the \"Side Effects\" psych-fest. Agusa live, as witnessed by their Greek fans, are on top of their game, here delivering extended versions of the songs Uti vår hageand Kärlek från Agusa. The latter clocks in at 3.11 on their debut album Högtid,but here it is more than four times longer and vastly different. And better! Katarsis, alreadyout in a limited quantity of 500 copies on 140 gram vinyl This is the 200 black edition by Kommun2 (home to Yuri Gagarin, Hills, Öresund Space Collective and The Spacious Mind).